Sharp phones have always been a bit on the strange side and the newly released AQUOS R2 makes no exception. The company just unveiled the second generation of the AQUOS R lineup with top-notch specs and an interesting feature - dedicated camera for video recording. The phone comes with a high screen-to-body ratio with a small notch at the top for the selfie camera. The screen itself measures 6.0" in diagonal and sports a high-speed IGZO IPS panel with 19:9 ratio and WQHD+ (1440 x 3040 pixels) resolution and 100 Hz refresh rate. The highlights list continues with a Qualcomm Snapdragon 845 chipset, 4GB of RAM and 64GB of internal storage, which is also expandable up to 400GB via microSD card. All of this is powered by a 3,130 mAh battery and runs on Android 8.0 Oreo-based OS. 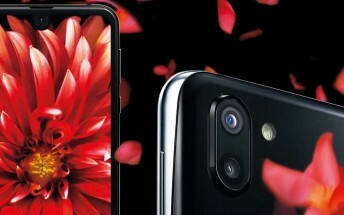 As for the camera setup, there's a standard 16.3MP front-facing sensor for selfies and a double camera configuration at the back - one 16.3MP unit just for video recording and another 22.6MP sensor for stills. The video-only camera comes with a few cool features - it records in 4K in ultra-wide angle (135°), although the angle narrows to compensate for shaking. In addition, an AI takes photos automatically during a video shoot. You can see what the video camera is capable of, what the AI Live Shutter works and how it handles image stabilization in the sample videos below. On top of everything else, the device is IPX5/IPX8/IP6X certified and boasts Dolby Vision and Dolby Atmos for a richer multimedia experience.